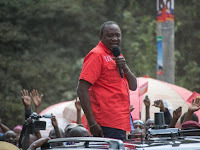 Tuesday February 12, 2019 - A section of Mt Kenya leaders have reportedly formed a group to name and shame those leaders who are campaigning for Deputy President William Ruto’s presidential bid in 2022. The leaders, who are a combination of political dinosaurs and political rejects, have vowed to ensure Central region speaks with one voice in 2022. The group has declared that President Uhuru Kenyatta is still the region’s kingpin and anybody who will be campaigning for Ruto in 2022 will face dire consequences. The group’s leader, Maina Kamanda also said that they will summon Bahati MP, Kimani Ngunjiri and Gatundu South MP, Moses Kuria, for questioning Uhuru‘s development record in Central Kenya. However, political pundits have condemned the group’s actions saying the more Maina Kamanda speaks about Mt Kenya region the more Uhuru is losing political grip in the vote rich region. “Maina Kamanda is a political opportunist who has been misleading Kikuyus for many years. He was rejected in Starehe and now he is trying to dictate other Kikuyus. He is a loser and he is embarrassing the president,” Nyeri politician Alan Kimani told Inooro FM on Monday. Kimani said Uhuru should stick with strong leaders like Kuria and Ngunjiri who always speak the truth instead of sycophants like Kamanda and former Dagoretti South MP, Dennis Waweru. “They are misleading the president and he is now seen as enemy of the Kikuyu nation,” he said. those are mungikis with their dog.